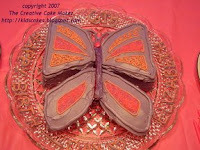 I have to give credit for this Butterfly Cake to Birthday Express. I found out the day before that I needed a cake for my niece's birthday party (we were trying to coordinate schedules). I am the cake lady so, naturally, I volunteered to make the cake. Especially since it was mentioned we could always BUY a cake. I couldn't allow THAT. I was looking for ideas for a simple cake. One I could bake, cool, and decorate in about 2 hours. This one looked like it fit the bill. 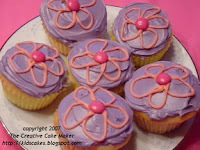 It only uses one 8" or 9" round cake pan, so I used the rest of the cake batter and icing to make the Flower Cupcakes. I added Wilton Color Gel (Sky Blue and Christmas Red) to make the purple icing. It actually had a satiny sheen to it.